Before MEGR 3171 I had never heard of a Photon or a Raspberry Pi; this project introduced me to the scope of IoT. My plan for this project was to use an IMU sensor connected via a Photon allowing me to view the data remotely in real-time. The problem I encountered throughout the project was getting the data to publish to the particle dashboard server. I edited the provided code from serial.print to Particle.publish which should allow the data to be viewed on the dashboard. After changing the command the dashboard would being to publish the heading of the data I wanted to view but the data would be "null". In order to view the data collected by the sensor I used Windows CMD to interface to the sensor through the serial port of the Photon. Moving forward, my goal is to continue to update the code to find a way to publish the data when it can be viewed remotely. Then, I plan to integrate the battery shield to allow the sensor and photon to run off a battery pack. Once this is done I would like to 3D print a compact case to put all the components in a easy to handle package. This could then be fastened to a street car or maybe a kart for some elementary data acquisition. functions over either SPI or I2C. 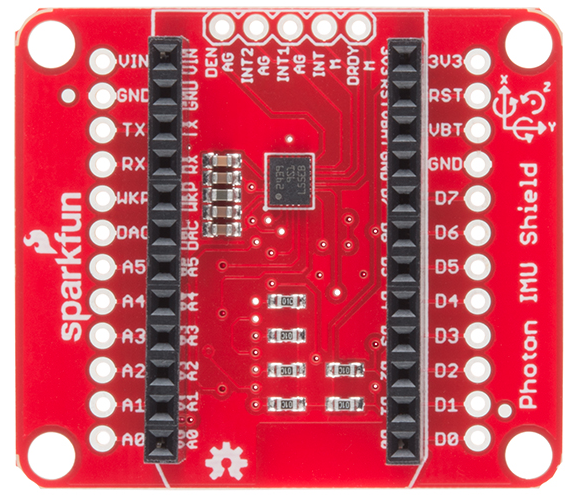 If you have the Photon IMU shield, no extra wiring is required. (CSG, CSXM, SDOG, and SDOXM should all be pulled high. #define DECLINATION 7.28 // Declination (degrees) in Boulder, CO.
// substituted for each other. Thanks to Jim Lindblom @ SparkFun Electronics.